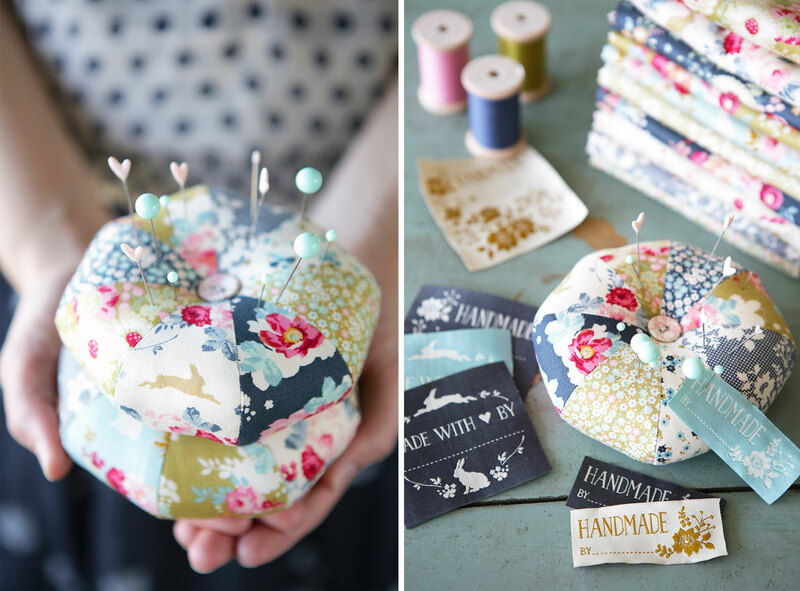 These lovely pincushions are very easy to make, and how you choose to put the fabrics together has a big effect on the result. You need 8 lovely matching fabrics, embroidery yarn and needle, and 2 buttons. 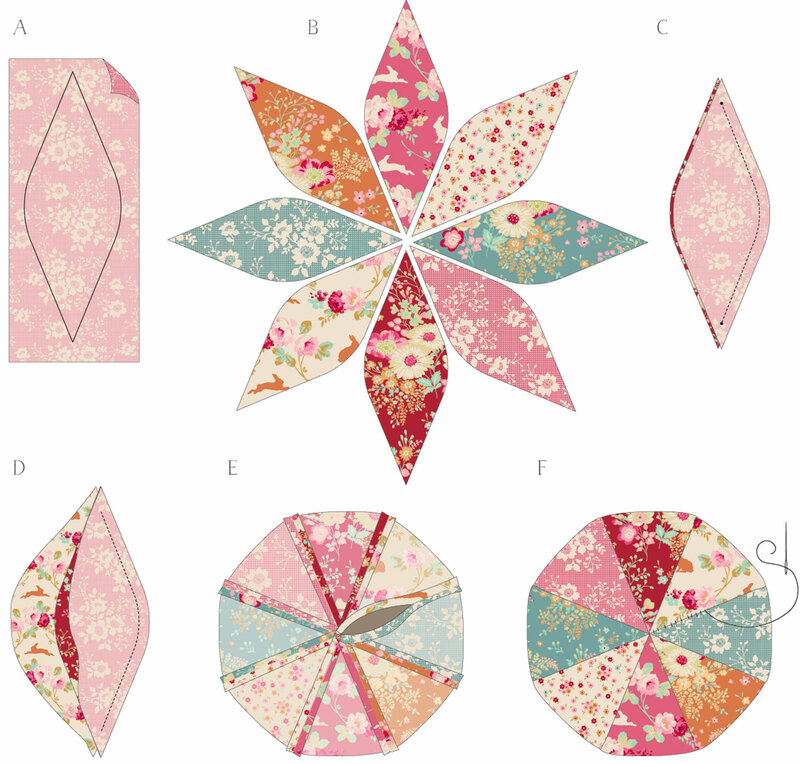 Here is the Pincushion Template. The dotted line on the template shows the seam, and the outside line is the 0.25in (6mm) seam allowance. We suggest printing the template onto thick photo paper; you can then just let the pen slide along the edge of the paper shape when drawing the shape onto the fabric. Draw the shape onto the back of each of the eight fabrics. See figure A. Cut out each piece along the drawn line. 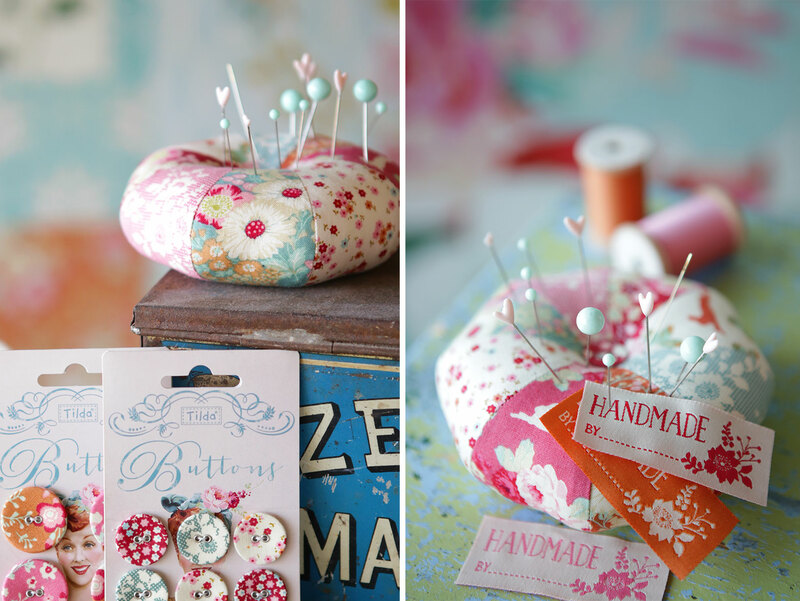 Place the pieces in a “flower shape” on the table to see in what order the fabric pieces look best before you sew. See figure B. Place two pieces right side together and sew 0.25in (6mm) in from the edge. See figure C.
Open these out and then place the next piece right side against one of the sewn together shapes. Sew on in the same way as before. See figure D.
Continue until all the shapes are sewn together. Now place the two end pieces right side together and sew along the line until you have a couple of inches of opening left for turning through. 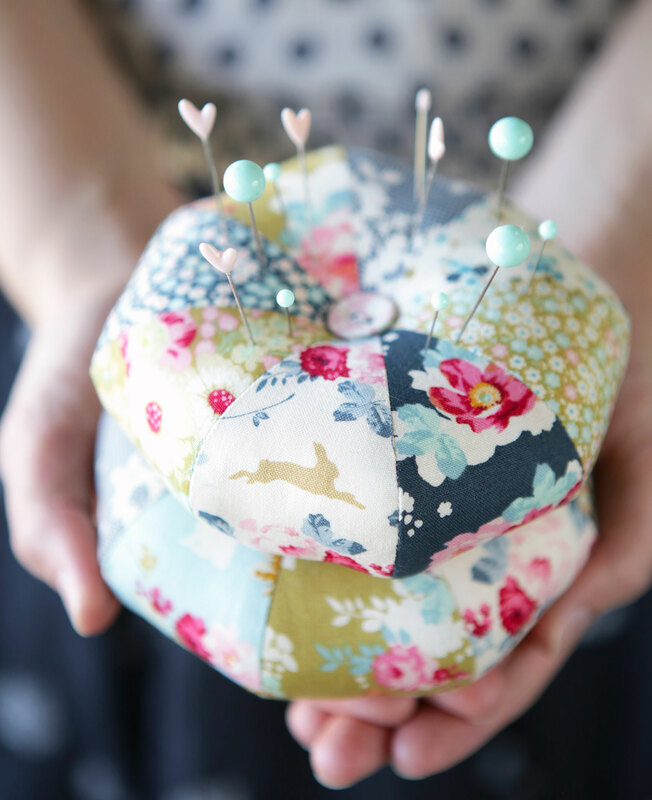 See figure E.
Turn through to the right side, fill the pincushion with toy stuffing/wadding and then hand-stitch the opening shut. See figure F.
Next, thread a needle with a long strand of embroidery yarn. Insert the needle through the back of the cushion to the front, through a button placed in the centre, and then back from front to back and through the other button at the back. Pull the yarn ends to make a little indentation in the cushion where the buttons are and then tie the ends together securely and trim thread ends.